Shooter has been "struggling in the presence of Overwatch"
Digital analytics firm Superdata has predicted that Take-Two and Gearbox's team-based shooter Battleborn will be forced to adopt a free-to-play business model after facing stiff competition from overwhelmingly successful rival Overwatch, which Superdata identifies as the best performing PC game in terms of digital revenues. 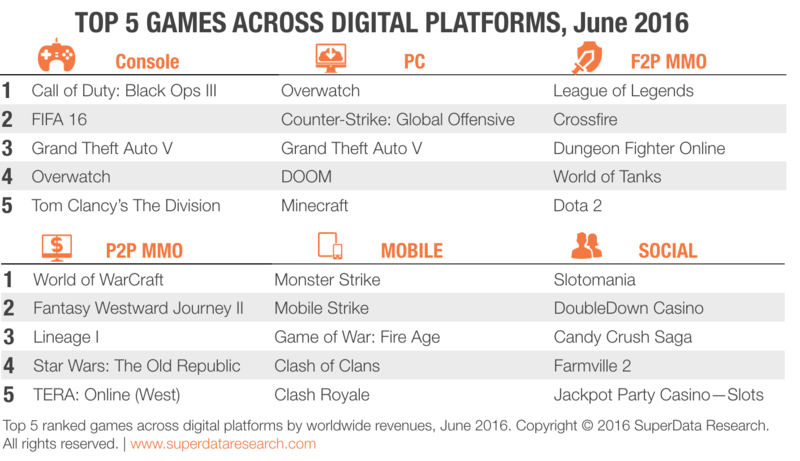 As part of the company's analysis of the most digitally profitable games worldwide in June, Superdata likens the fate of Battleborn to that of Evolve, which performed well at launch but faltered soon after. However, the report maintains, Evolve has seen something of a resurgence, at least in audience figures, following a switch to the F2P model - a path Battleborn may well take itself. "Gamers have so far responded positively to the change [to Evolve], propelling it into Steam's top 20 rankings, measured by concurrent players. However, the publisher has yet to profit from its gamble as revamped micro-transactions have not yet been added. The game's trajectory raises questions about the place of niche titles in a saturated FPS market dominated by Call of Duty and the Battlefield franchise. "As the console cycle reaches its maturity stage, we expect to see other smaller titles go free-to-play to avoid getting crowded out by their bigger competitors. One title that is well-positioned to follow Evolve's example is Take-Two's other recent shooter Battleborn, which has been struggling in the presence of Activision Blizzard's breakout hit Overwatch. We anticipate the publisher to announce a free-to-play makeover for Battleborn in the coming months." Elsewhere in the analysis, Superdata names Black Ops III as the console title providing the highest digital revenues, with LoL, WoW, Slotomania and Monster Strike heading up their respective categories. This is a travesty. I can't think of another word for it. Battleborn is a solid game, comparisons to Overwatch are limited at best but try and explain that to gamers. Perhaps the marketing team did a poor job at explaining this to potential customers. Also, the release of the Overwatch demo at Battleborns launch was devastating and in my eyes mean spirited. It wasn't mean spirited, it was business. I love (borderlands) / hate (aliens) Gearbox as much as the next person, but 2k or whoever published the game did a very poor job in marketing Battleborn when they knew very well what Blizzard was up to. BB just got drowned in the Overwatch gunfire, even the cinematic sold people off, like minecraft kids and such that had never considered a Team Fortress type game. And you know, Pixar like cinematics. During concept stages, Gearbox should have considered BB to actually be a Borderlands spin-off, with pre-established and loved characters, and I bet they would be singing a whole diferent tune at Gbx offices now. Blizzard has a lot of fans and extraordinary games under their belt to keep pulling people in, and the money to back it up. Gearbox is not so furtunate, they were lucky with the first borderlands, made the second one even better and a lazy/lackluster 3rd...ish. They have a Borderlands niche, but that's all it is. They would need to rely a lot more in pre-established characters in order to be successful, either that or not try to dig a market share from the giants without the money to, well, market it. Epic's own take on team fortress, Paragon, will go a very similar way, not necessarily free to play, but carving a little niche within their own fanbase (I was a big one back in '99) or among people with machines that can actually RUN their bloody games and still have decent frame rate. I know well that Epic has always had their style and ramping up the graphics to 11 is part of it, but Gearbox's cell shading style isn't that demanding, and I really believe Battleborn would have faired a lot better if they focused on characters people already knew. The reverse side of the coin would be people complaining about yet another borderlands game that also isn't really borderlands 3, and that all they do is BL games. Oh well. A mere 10 weeks after release, BattleBorn is the $15 incentive of a HumbleBundle. I think it is safe to say that this game will not get another polishing pass to get it ready for f2p. Between unskippable music videos an storyboad pictures with voice over, those first 30 minutes of BattleBorn are among the roughest out there. This game was never released and will never be released again, it was flushed to the public to die and looking at Steam player numbers it already has.